I am sure everyone has a comb or two or more. Here's the question for everyone. How many of you actually clean the comb on a regular basis? The comb is perhaps one of the most overlooked item on the dresser that we pick it up, comb our hairs and then put it down without even giving it a second thought.. Perhaps one should take the time to closely examine between the teeth of the comb and may just be surprised the amount of gunk accumulated over the months or even years. Here's what I do to combat this problem and to ensure a relatively clean comb. Firstly, let me explain that all my combs are from hotels on my trips. As I travel regularly, I will pick up the new comb from the hotel, whenever I check in and ditch the currently one. Rinse. Repeat. 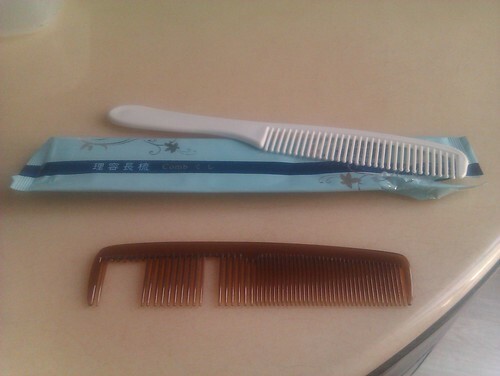 As you can see from the picture, the comb below is the older one and is missing a few teeth. Partly because the comb isn't of good quality to begin with and also partly I haven't be travelling lately. Anyway, glad I made the trip to Taiwan. Hi new and clean comb! Road Warriors of the World unite!